A superb companion. Comes complete with handy carry case. 3 x Flared: 4mm, 5.5mm, 7mm. 3 x Phillips: PH1, PH2, PH3. 3 x Pozi: PZ1, PZ2, PZ3. 6 x Hex: HW3, HW4, HW5, HW6, HW7, HW8. 6 x Torx: T10, T15, T20, T25, T30 and T40. 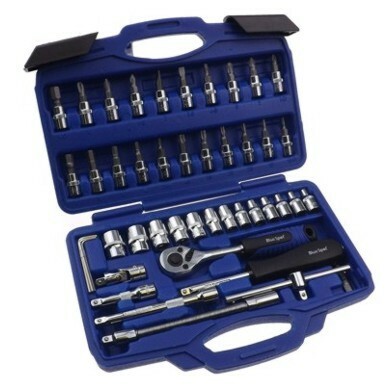 3 x hex key wrenches: 1.5, 2.0 and 2.5mm. 1 x 1/4in drive universal joint. 2 x 1/4in drive extension bars: 2in and 4in. 1 x 1/4in drive flexible extension: 6in. 1 x 1/4in de-sliding T bar. 1 x 1/4in drive quick ratchet handle. 1 x 1/4in drive spinner handle: 6in. 1 x 1/4in drive bit adaptor.